Sir Norbert the Green Knight, affectionately known as Norby, has upgraded his armor! The college’s loveable mascot now has freshly polished steel and a sleeker look that he was able to debut at this year’s SNC Day open house, Sept. 22. The knight’s new look was driven by practical reasons: Not only had Norby’s armor dulled through years of tireless service but – to put it as delicately as we can – a knight tends to get a little warm under those layers of chain mail and protective plate. Norby is a beloved fixture at campus events, and it's personally important to him that the young fans who cluster around him find him ... well, nice to know. Then, his armorers felt there was room for improvement in his helmeting: His old visor, for instance, did not afford him the good lines of sight made possible by the newest options in knightly fashion. Spurred on by the historic achievements of SNC’s Green Knights in the first decade of this new millennium, a call arose for a new and fitting symbol of school pride. SNC was hoping for a champion to lead the college to even greater glories in the field of athletic endeavor, in co-curricular life, in the classroom and in the community. But from whence would come such a champion? To Norbertines around the world, an appeal was sent for help in finding our new hero. They joined the cause with feverish enthusiasm, searching every abbey, every priory … even the ruins of those long past. From ancient Grimbergen to Bois Seigneur-Isaac they searched. From Ardenne to Csorna. But no champion came forward. The campaign spread, from Schlagl, to Wilten, to Leffe, to Bonne-Esperance. Prémontré … Strahov … Dunwald … Magdeburg. To Trinity Island, and Berne, and Egglestone, and Beauchief. No stone was left unturned. 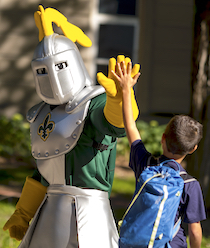 Norby and the St. Norbert community welcomed thousands of visitors to campus Sept. 22 for the 10th annual SNC Day celebration. Visitors took part in tours of campus, children’s activities, educational events and more. Check out the video to recapture the fun.